The Keen brothers (Henry and Oliver) have a special affinity for music. It’s well known that family members have tight vocal harmonies, but it’s not so common to find siblings who are “well-tuned” DJs and producers and share the decks. Soundspecies are one of these rare examples. The musical journey of the duo, which started little more than 15 years ago, brought them from a small Dorset village to travel and perform all over the world. Their journey is fully embodied by their sound, from their very British broken-beat and house mixes, remixes and productions of the early 2000s, to the more recent works brimming with West African vintage funk and Afro-Caribbean rhythms. Their latest release, Soundspecies & Ache Meyi (Remix EP) published by Manana Records and presented a few weeks ago at the Pickle Factory, is a reminder of their global and eclectic cultural perspective. In conjunction with the show, we reached Henry to enjoy a clearer view on their career and development of their sound. Your recent gig at The Pickle Factory marked your new EP launch. What can you tell us about the project and how did you feel about letting other quality musicians and producers “put their hands” on your tracks? The release was a remix EP of selected tracks from the Soundspecies & Ache Meyi LP. We thought it would be a good chance to re-open the files from the album and invite some producers we respect to bring their own talents and sound to the mix. Obviously, the idea was to help bring a bit of extra interest to the project, but also there was a genuine interest and curiosity from our part to see what came back. We were really happy with the overall outcome and glad to include our own remix of “Alina’s Calypso”. We know that your collaboration with Ache Meyi started back in 2016 thanks to MANANA/Cuba. Can you tell us a bit more about your days in Cuba and the collaboration? Being in Santiago de Cuba was an assault on the senses, but an experience we both relished and found incredibly rewarding. We knew little about the heritage of Afro-Cuban styles originating from this seemingly overlooked end of the island, and we were blown away by how deep the music culture runs through the city, and how much of Cuban music originates there. Getting the collaboration together had many challenges, both logistically and culturally, but luckily Olly had spent almost a year in Colombia leading up to the Cuba trip, so at least we had a Spanish speaker! I’m not sure how we would have coped without that. The album with Ache Meyi was recorded at the legendary EGREM studio. How was it to work there and how did you feel about relating with such an overwhelming music tradition? Getting into EGREM studio was a vital part of the development of the collaboration because it allowed us more control over the sound and gave us a chance to record the percussion and vocals with separation. It meant we came back to the UK with stems to work with and could spread things out in the mix and compose, which was difficult during rehearsals. The studio was such an amazing space, and we could almost feel the grandeur of its heyday hanging in the air. Unfortunately, much of the gear was in a pretty sorry state, and we weren’t able to use the big AMEK desk. I’ll never forget watching the engineer stuff bare wires into the wall socket with a stick! 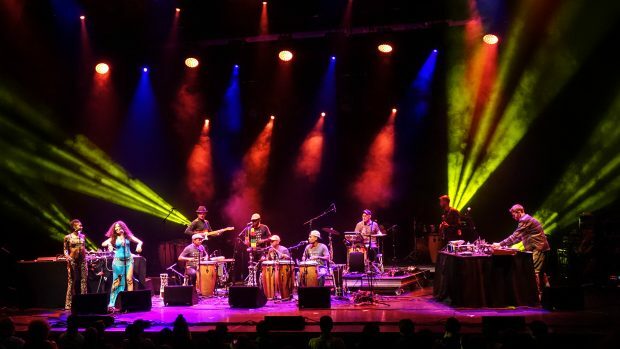 Despite your love for the Afro-Cuban and Afro-Caribbean music, Soundspecies’ tracks and remixes sound pretty eclectic. How do you let elements from worlds-apart cultures coexist? To be honest, we’ve never really been interested in just one style of music or a specific geographical region of reference. We both have eclectic tastes and each piece of work or project is approached with fresh ears and an open-minded approach. I think the common ground that runs through our output is a shared love of repetitive, percussive grooves that induce movement and remove you from your conscious mind. That could come from folkloric drum loops, sampled breakbeats or synths/drum machines in equal measure. Also, your personal music careers are quite rich in experiences. How and why do you decide to create or jump on board a new project? I think we both know if a project is something that excites us. The Manana/Cuba project was a no-brainer really. We’d always been interested in visiting Cuba, so being invited to join a new festival there and having an opportunity to learn from expert musicians and share our own music was too good to turn down. I think, overall, it’s important that the motivations behind the project are genuine and that the musical side inspires us. Even if you’re not literally Londoners, having worked and collaborated with many London-based musicians, you’ve become an integral part of the city’s music scene… How do you feel about it? What do you like and what would you change about it? We’ve collectively spent about half of our lives in London now, and it feels like we’ve seen the musical landscape change for good and bad over the years. We’ve definitely been lucky to meet and collaborate with plenty of talented people here, but it would be humbling to imagine being integral in the city’s music scene overall! Losing places like Plastic People and Passing Clouds has definitely negatively affected the richness of the city’s music, as they could be considered scenes within themselves really. We spent so much time in those places (as punters and performers) that it’s hard to fill the void. What needs to change is the way important musical institutions get closed by greedy councils and developers. What artists/bands/styles are you listening to these days? Is there any particular music you’d suggest for us to listen to? There’s so much amazing music from the past that is still yet to be discovered that sometimes it’s hard to keep up with all the great stuff that’s happening today! Luckily, we have many friends and family members who are releasing and performing great stuff currently, so that keeps us in the loop to some extent! Live-wise, check out Big Ben Jorge, Ariwo, Agile Experiments and Gnawa London if you get the chance. We’re also looking forward to seeing Fofoulah perform again soon. Loving the recent releases from 2000 Black, Mo Kolours, TY, Hello Skinny, Glenn Astro & Hodini and Nu Guinea to name a few. Also, Olly collected (and recorded) some amazing music on his travels in Colombia. You’ll have to ask him about it! Apart from the show at The Pickle Factory, what’s on the agenda for Soundspecies? We were lucky to secure some funding from the PRS Foundation recently, which will help us to develop and document the new material we composed with the band during the run-up to the Pickle Factory gig, as well as developing our core electronics set up. We’ve always incorporated a mixture of hardware and software when performing live, but making the process intuitive and flexible has not always been easy. The aim is to get to the point where we can compose with a similar set up as we perform with, making the whole creative experience more fluid. We’ll be working on finishing those new tracks for a release a.s.a.p. and have a couple of exciting new projects in the pipeline. There’s a last canonical question we usually ask our interviewees, which is… How would you introduce Soundspecies and your music to someone who has never listened to you? That old chestnut! It’s always tempting to start listing genres here, but we think this explains pretty well: Soundspecies explore the connections between the rhythms of traditional folkloric percussive music and the sounds and forms of electronic dance music.